I ran a toolpath yesterday with Const. TEA and the endmill broke, I had followed manufacturers recommended SFM and chipload. Then I let G-Wizard do its magic. I noticed that the recomended SFM and IPT are lower than those recommended by the manufacturer, I guess those numbers are pretty universal, right? People frequently ask where G-Wizard's numbers are pegged--are they aggressive or conservative? Closely related are questions about the Manufacturers numbers. This user found G-Wizard was more conservative than what the manufacturer quoted and it was a good thing. As I mentioned in the article about calculating feeds and speeds, sometimes manufacturers are overly aggressive in the interests of marketing a product that seems a lot better than competitors. In fact, it may only be more aggressively rated than the competition while being no better a cutter. How aggressive should you be with feeds and speeds? 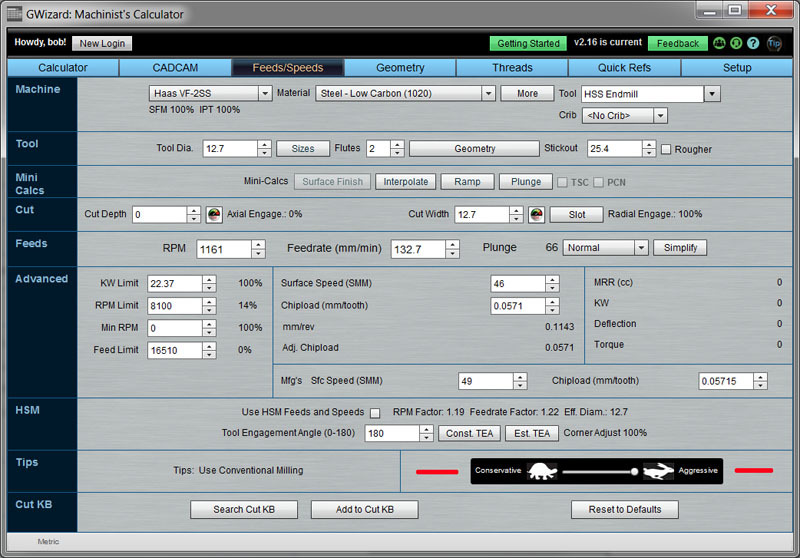 Let's talk for a minute about how the G-Wizard Feeds and Speeds Calculator is calibrated for aggressiveness. As mentioned in the calculation article, G-Wizard considers a lot of manufacturer's recommendations in an apples to apples match up (i.e. same coatings and geometries). It then does some very sophisticated number crunching to try to separate out the fact from the fiction. In other words, it tries to determine whether a manufacturer is overly aggressive (great MRR, lower tool life) or overly conservative (great tool life, lower MRR) to get to some "balanced" numbers. It does this by analyzing a minimum of 3 manufacturers for uncommonly used tools and 12-15 for commonly used tools (e.g. endmills or twist drills). What's the Difference Between Toolroom and Manufacturing Feeds and Speeds? Using some empirical testing and research, we took all of that data and determined the point we felt was appropriate for Toolroom Feeds and Speeds. By that we meant the most aggressive feeds and speeds that could be used for the first time on a new part without much risk of breakage or unduly short tool life. We have a lot of time into this and some proprietary statistical algorithms and it works well. This is a very useful baseline for a lot of machining operations. High-Volume Manufacturing Machining can be looked at like racing--if you're not breaking anything, you're not going fast enough. But, for a lot of jobs, it's faster to avoid breaking anything versus gettiing the absolute edge of the envelope material removal rates. The latter, edge of the envelope MRR's, are Manufacturing Feeds and Speeds. Determining Manufacturing Feeds and Speeds is also a lot like tuning a race car--you go faster and faster until you break something, then you back off slightly. If you're making enough parts, this approach works well. You can tune up your manufacturing process to the best performance for profit, break a few things along the way, and back off slightly. The "Gas Pedal", is depicted by a tortoise and a hare, much like the old Bridgeport manual mills had for speed control. It represents not just conservative versus aggressive but also surface finish and tool life versus material removal rates. The default best MRR for toolroom situations where you're making one part and you don't want any breakage is one notch to the left of aggressive. This is the default position for the Gas Pedal. The remaining step to the right is only the first rung on the ladder of increasing feeds and spees to get to the best Manufacturing Feeds and Speeds. You're unlikely to break a tool there, but it can happen every now and again with difficult materials and toolpaths. Where Do We Go After the Most Aggressive Step on the Gas Pedal? Since the last step on the Gas Pedal isn't really as aggressive as you can get for most jobs, the next step is to add your Manufacturer's data to G-Wizard for your tooling. Unless your manufacturer is cheating pretty good on the numbers by quoting values that are too aggressive, the manufacturer's recommended surface speed and chipload are an excellent next step. G-Wizard will take that data and further massage it. It may well get more performance out of it, or it may soften the numbers somewhat depending on the exact nature of the cut you are contemplating. Be sure to look at the comparison of the two--G-Wizard's defaults and the Manufacturer's numbers. Check out the results for several typical machining operations you might contemplate. G-Wizard's Tool Crib function under Setup is a good way to setup this kind of comparison. In fact, you can create an entry for several manufacturers including G-Wizard's defaults, tee up a particular set of cut parameters (Endmill diameter, material, flutes, cut width, cut depth, etc. ), and then flip through the tools to compare the MRR's. What Comes After the Manufacturer's Numbers? After you run the Manufacturer's numbers on a job there are two possible outcomes--they work or they don't. Believe it or not, you're trying to find cases that don't work. They're more valuable than cases that do, because you want to go until something breaks (or surface finish, tolerance, or some other metric suffers) and then back off slightly. For our friend whose story I quoted at the top, the one that broke an endmill with an HSM toolpath running the manufacturer's numbers, he now has two good data points. He knows G-Wizard's default numbers worked, and he knows he broke an endmill with the manufacturer's numbers. He can now find the spot between the two that gives the best performance without breaking the tool. Depending on how much time he has to experiment, and how much it is costing to break tools, he can get pretty precise. His next step is to either back off the Manufacturer's Numbers slightly or to pick the midpoint between the two and try that. I prefer the latter approach, but if you feel lucky, just back off a little. 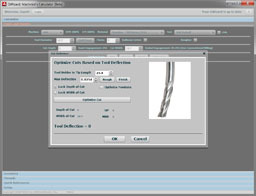 G-Wizard provides a number of tools for "backing off". You could use the Gas Pedal with the Manufacturer's numbers. A better way is to use the surface speed and chipload scaling in conjunction with the Tool Crib. The scaling lets you apply a percentage multiplier to the two values. For example, you could try "0.95" or "0.9" to reduce the values 5-10%. If you didn't manage to break a tool with the Manufacturer's Numbers, crank 'em up further using the same tools. Try 1.1 or 1.05 to add 5 or 10%. Given the choice, focus on tweaking chipload first. It takes much more time to find out if you have a little too much surface speed because it increases the wear which may not immediately break the tool. You could be already past it after the 5% increase but keep increasing to 20-25% before the tool finally gives out. If this all sounds like a systematic process that will benefit from record keeping and careful analysis, congratulations--you understand! 1. Identifying and tracking the key variables that govern cutting speeds. Remember, G-Wizard manages 40-50 variables for each feeds and speeds calculation, and there are still more I intend to cover over time. 2. Learning by trial and error where the line is based on your shop's way of doing things--you shop's Best Practices, in other words. This stuff is repeatable. If you put it into a database, and index that database with the right information, it will be a Treasure Trove that can improve every situation--from Toolroom to Manufacturing. Going back to the case of G-Wizard's numbers not breaking a tool where the Manufacturer's numbers did, a Cut KB would track a lot more variables to make it easier to identify when the more aggressive numbers are trouble and when they might be fine. Knowing exactly where the line is and which variables to track is a critical advantage for better feeds and speeds. I'll talk about exactly how to go about this in an article focused entirely on Cutting KB's. For now, it's important not to lose any valuable data. Whether a cut succeeds or fails, keep a record of it and track as many variables as you can. G-Wizard's Cut KB function is an ideal way to do this and the variables it has chosen to track are backed up by a large body of independent research. Whether you like G-Wizard or not, make sure you write down at least those variables in your notebook. I'll be explaining not only how to go about it, but why those particular variables matter in the Cut KB article. The sooner you start building your Cut KB, the sooner you'll have enough data for it to start becoming useful.